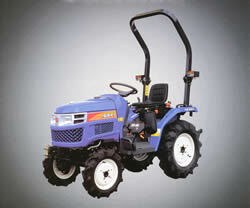 TM series is classified into most compact tractor segment. 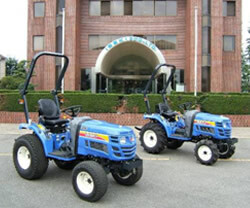 Nevertheless, all new TM tractors provide excellent performance and high efficiency for professional and private users. The horsepower of 25, 23 and 20PS is selectable, and total nine model line-up including transmission type, Mechanical transmission or HST and ROPS type Center or Rear mounting are available for their landscaping and agricultural applications. 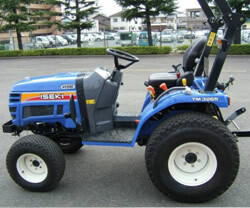 New TM3265, 3245, 3215 tractor adopt the complete floating mount system including dash panel and steering post. It contributes to good isolation of noise and vibration for operator's comfort. 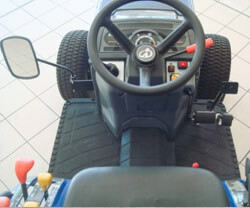 All controls, pedals and levers are placed in suitable position. 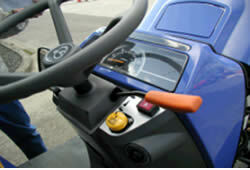 Also, redesigned visible instrument panel and combination type lighting switch are equipped with TM series. Operator feels less fatigue even for long operation. Larger displacement engine of 1.5 Liter is mounted on TM3265. TM3245 and TM3215 have 1.1Liter engine. Both engines give enough power for various applications. 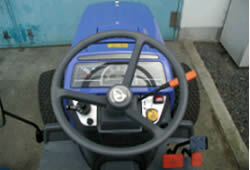 Thanks to flip-up engine bonnet, user can reach engine room easily for daily maintenance. 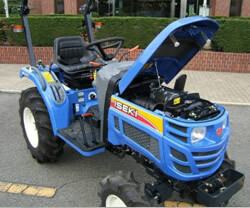 Iseki's most compact tractor TM series for both private and professional users has been redesigned to have even versatile features while improving the superior performance. The 3-cylinder engine can give you power enough to offer better response in difficult field conditions. 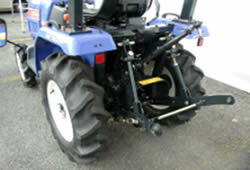 The front and rear axle can respond to various field conditions with wet disc brake built in it. The 4-wheel drive and differential lock ensure solid traction, even on slopes. On hard surfaces, 2-wheel drive will be helpful for long tire life. The simple construction and easy access to diesel engine enable you to make the daily maintenance easier. The TM series can command the wide variety of applications. 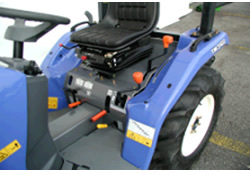 It has the reinforced chassis enough to fit wide range of accessories and implements.